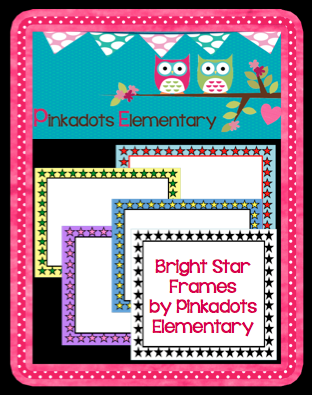 Freebie: 5 Bright Star Frames! If you love freebies....PLEASE follow our blog! :) You won't regret it! 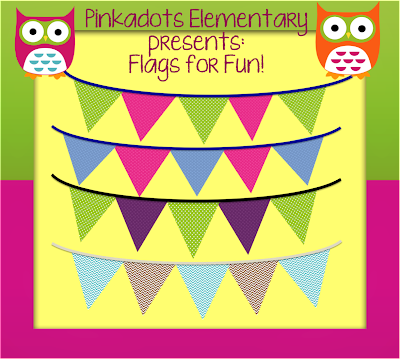 If you thought last week's freebie was fun, wait until you see what we have for you today! First we made really cute and useful flags, then it was the polka dot paper, and now we have really fun and BRIGHT star frames. I love these because they are a great accessory to any worksheet or project. I have even included a black and white version for easy black and white printing. This was my first attempt at making frames and I think they came out pretty good! I'd love to know what you think! Leave me some comment love here or on TPT! 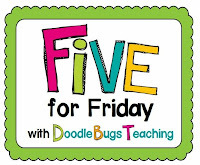 Five for (TGI) Friday! Book Reports, Birdhouses, cupcakes and more! 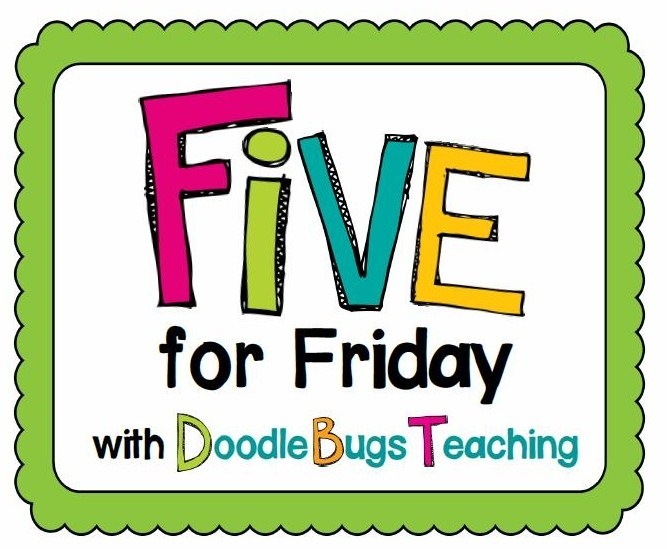 I am linking up with Doodle Bugs Teaching for one of my favorite linkys, Five for Friday... five random pictures from my week! 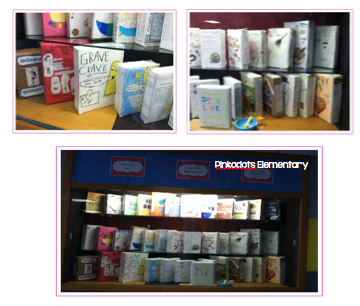 First off my lovely cereal box book reports finally made it into the display case in the lobby. The kids were so excited to see their work in the front and center of our school! My class does a creative book report monthly for homework and believe it or not, the kids LOVE them! Next up is my "Green Eggs and Ham" themed birdhouse that I created for our art show raffle. Our art teacher is so creative. She purchases wooden pieces for teachers to paint and design and then they are raffled off at our yearly art walk. I found an inspiring birdhouse on Pinterest and it gave me the idea. Overall, I love it! I need to touch up the bottom because I am a perfectionist and it bothers me that there is some white on the turquoise and some turquoise on the white. My kids are all BEGGING to win this birdhouse. RAINBOW CUPCAKES! My daughter and I went to a "Mommy and Me Baking Day" at a local bakery. We made adorable rainbow cupcakes that were so fun and amazingly delicious! The best part is they weren't as hard as they look! 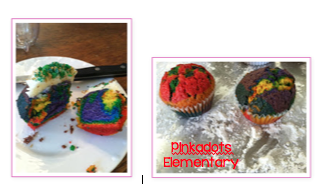 The recipe is floating on Pinterest, just look for rainbow cupcakes or rainbow cake. I will be making these for her classroom birthday next December! 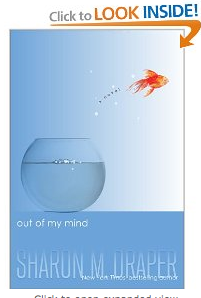 Have you heard of Out of My Mind by Sharon Draper? It is AMAZING! I am currently reading it right now and I cannot put it down. I don't want to give too much away about the book, but you can read the summary on the amazon link. My class will be reading it when we finish Wonder, right now they are hooked on it and eating up every word! I am saving the best for last! I am SOOOO excited to get into Unit 6, although it doesn't start for us until May. I have yet to start Unit 5, but it is less exciting. Anyways we will be studying heroes. 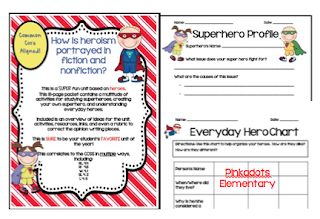 We are going to start by studying and creating our own superheroes and then move on to nonfiction everyday heroes. We will be incorporating technology through some awesome hero websites and I'm SURE this will be my student's favorite unit. It will be perfect to end the year off. 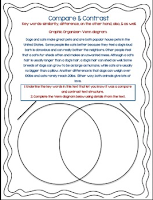 I created this great teacher friendly/student worksheet packet with essential questions, CCSS, activities, lists of possible resouces and even a rubric. I CANNOT wait to use it! :) You can check out the packet at my TPT store here. 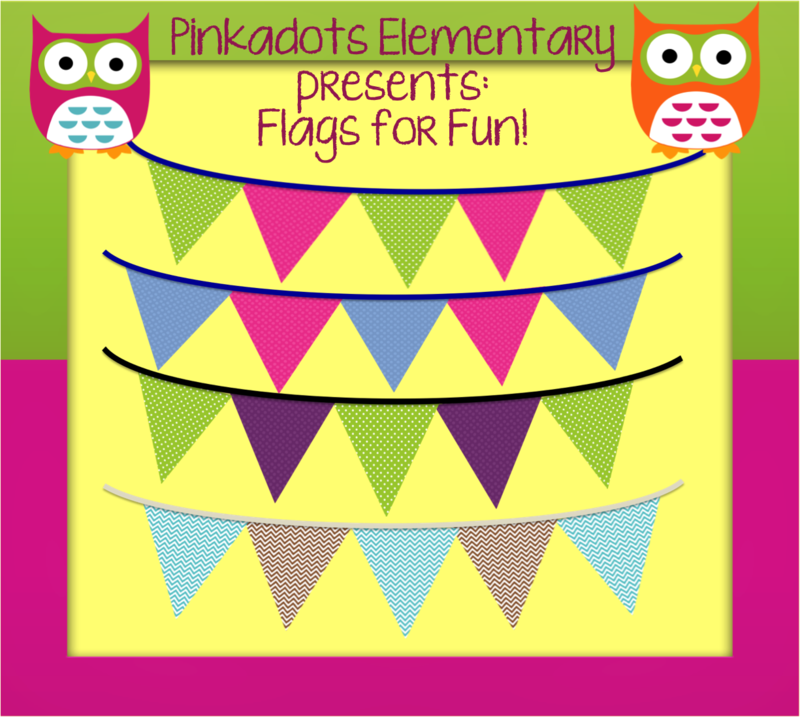 Thanks Doodle Bugs for hosting! Linking up with the wonderful Jivey at Ideas By Jivey. This week's question is What do you use to help your kiddos get their thoughts out on paper? I've made it a habit to use graphic organizers as much as possible in my classroom. I feel that my lower students thrive from having somewhere to organize their thoughts before actually answering a question or writing a narrative. Although my students come into 4th grade expecting a lot of assistance, while using graphic organizers, I try to use the gradual release model. I think it is important to instill confidence and independence in students throughout the year. Students are on the actual "release" part at different times depending on their abilities, the topic being addressed, and their individual goals and needs. I used to use a ton of answer frames from Nancy Boyles to help my lower students, but with the CCSS our school is moving away from a typical "formulated answer response." 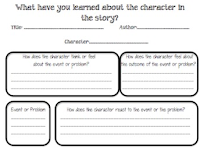 A time I use the most graphic organizers would definitely be during small group and guided reading. I think the students enjoy putting their thoughts down on thinking maps and they really do appreciate cutesy planning sheets. 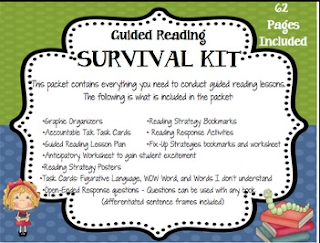 We put together our favorite organizers in a pack called "The Guided Reading Survival Kit!" I seriously wished someone gave me this file as a new teacher. It would have saved me a lot of thinking, time, and helped my students faster. Teaching students the basic text structures and the corresponding graphic organizer for each structure is also an important lesson I feel students need to master. 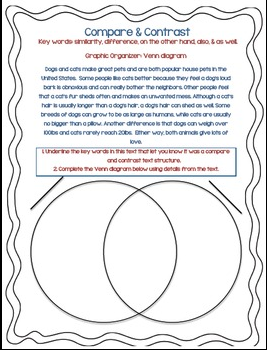 Because my class was particularly struggling with this, I created worksheets with matching posters. That sure did the trick because they quickly turned into pros, which was noted from the quiz at the end of the packet! 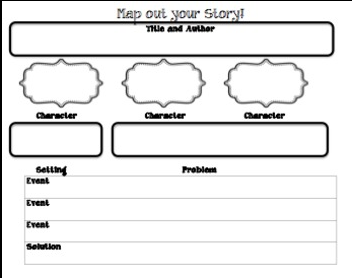 I also use a great graphic organizer for narrative writing. The kids can create it quickly, fill it in, and write a full narrative story quickly. 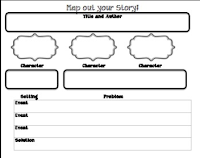 This led me to the idea to create a narrative writing game. I call it "Funny Ha Ha" because just saying that out loud makes me laugh. The kids absolutely LOVE it. 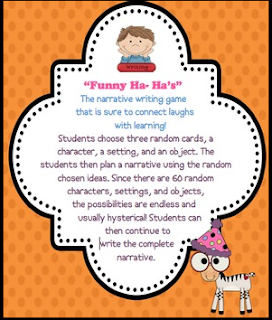 It helps them create and correctly use a planning graphic organizer before they start writing and the game portion makes it entertaining and new. I've used this as a whole class exercise, small group, intervention, and even individual work. Either way, the kids ask to play it over and over. We went on a ghost hunt today to look for prepositions! The kids had such an awesome time! I used a worksheet I found on Pinterest. The kids took a sticky note and drew a ghost. I then gave the class a few minutes to "hide" their ghost. The students wrote descriptive sentences about where they spotted ghosts around the room. They then had to circle the preposition, and underline the prepositional phrase. This was a great reinforcement activity to go along with our unit on prepositions that we are currently using this week. The spooky ghost was stuck to the fan above my head. 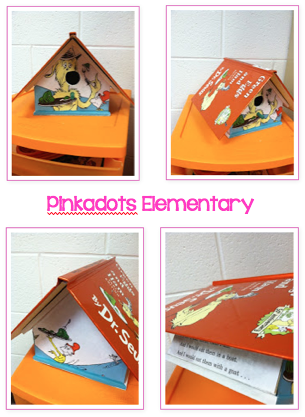 A pink ghost was hiding our teacher's birdhouse. A surprised ghost answered the telephone in our classroom. You can print the Preposition Hunt out in Google Docs here! Anyone else love to incorporate technology in the classroom or "needs" to give it a try for their review focus for the year? 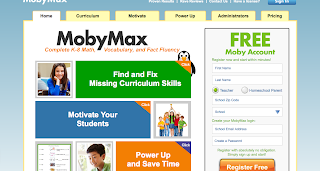 I just found out about Moby Max from my friend, Mrs. Wilson, over at Confessions of a Teaching Junkie. This is an awesome website for students to work on Math or Vocabulary skills and the best part it is FREE! We just happen to be focusing on word choice this marking period, so I love that it is a fun and fast way for students to be assessed on vocabulary. The program is very teacher friendly and took me less than five minutes to upload 50 students onto the roster. When you first sign into the website, there is a quick video that explains the services offered. I thought it was amazing that I can see how long my students work on the website, their individual scores and it was even COOLER that I can see the CCSS that the students mastered and still need work on. Some of my students thrive for higher level instruction and this website is great because it differentiates for students right away. Students start off by taking a placement test, which can range in time from 4-20minutes. So far my favorite thing about this website is that it is accessible on i-Pads. There are no crazy flash players involved and it is simple and easy to sign in to. My students are already excited to test this out at home. The website's statistics state MobyMax is a complete differentiated curriculum for K-8 math and vocabulary. Students using MobyMax for just 40 hours have shown an average of 1.5 grade levels of growth. I can't wait to see how it works on my students. Freebie: 7 Shades of Polka Dots! 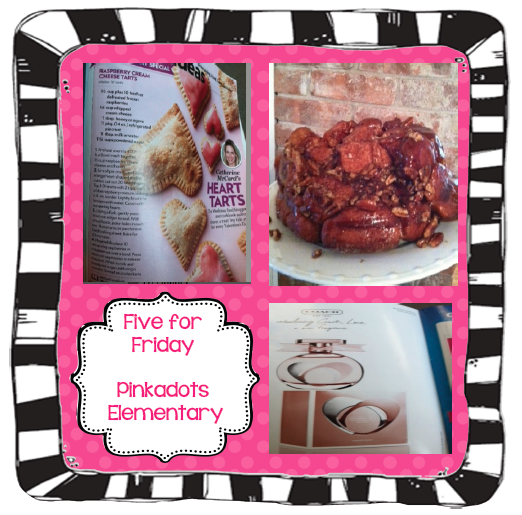 I look forward to Monday mornings for two reasons...#1, because it is usually a D&D day for coffee on the way to school and #2, to share a freebie and link up for the Manic Monday Linky Party @ Classroom Freebies! 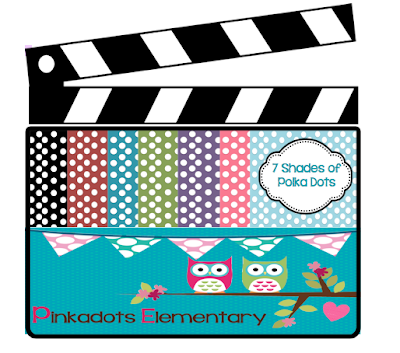 Today is exciting because we are sharing our NEW Digital Polka Dotted Paper! Please try it out and leave us some feedback on how it works for you. We'd love to see what you create with it! Don't forget to hop over to our Facebook page and "share" our CONTEST post for a chance to win anything in our TPT store for free! We are holding our first contest!! This is very exciting :) It's simple.. all you have to do is hop (yes we are getting into the Easter spirit.. lol) on over to our Facebook page, like us and then share our page! By sharing our page you are automatically entered to win ANY product from our Teacher Pay Teacher store! Contest ends Wednesday. Good Luck!! 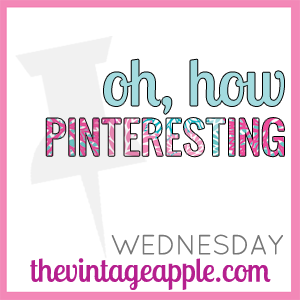 This is an awesome link up with <a href="http://www.thevintageapple.com/"> The Vintage Apple </a> about my favorite Pinterest ideas for the week. Since I am addicted to Pinterest, I thought this would be fun and simple! :) Here is a look at what is on my Board! Oooooo. M. G. I need to make this! YUM! I would absolutely LOVE this for my kids! Is this not the cutest picture? 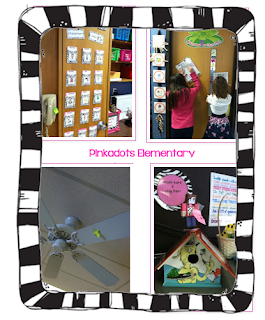 These are the cutest classroom rules ever! I am in love with the Super Hero clip art! You have to love this fun Linky from Latoya from Flying into First Grade! I figured I'd give it a try because it includes two things I love: reading about other bloggers and sharing random things about my life. The spin on this is you have to use your initials. SO my initials being TMS....left me stumped. M for movies! My husband and I recently signed up for Netflix and we have been watching one movie a week. My favorites so far have been 21 Jump Street, Bad Teacher, 30 Minutes or Less, and The Hangover II. I'm a fan of anything that makes me laugh and keeps my attention. S for SUSHI. Yum! I <3 sushi rolls. I'm not into the plain pieces of fish, but I love most any type of roll combined with veggies, rice, and especially avocado. Well that is a little glance into my life. Thanks for hosting the Linky Latoya! You can download them for free at our TPT store. Please let us know what you think! :) Hope you have a great Monday! Are you addicted to deal sites? My friends got me hooked on Living Social, Groupon, Zulily, and Babysteals, but have you heard about the new deal site for educators? I know every teacher is asking themselves, "Why didn't I think of this!??!?" It's called Educents. It will be a daily deal site featuring the latest educational products at 30-90% off! The site will launch April 2nd, so sign up now. Even better, if you sign up soon, you will get a $15.00 gift certificate. Enjoy the rest of you Sunday! 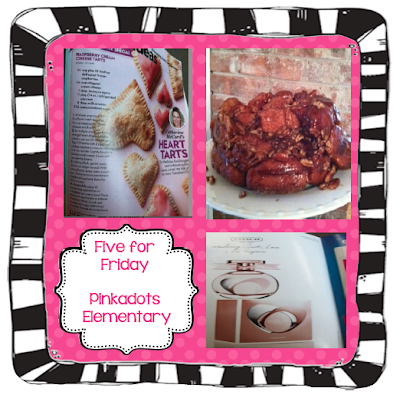 Hmmm, this is my first Five for Friday linky of randomness. I had great intentions of taking some awesome pictures of the million and one projects we worked on this week in the classroom, but it was a snow day today, WOHOO! (I'm seriously not complaining! After our first week of state testing, I needed the break and I'm sure the kids did too!) So these two classroom pictures and the three random pictures will have to do for this week! #1. 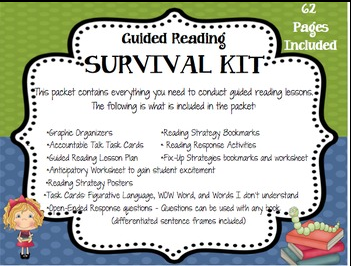 We are currently in Unit 4 of our new curriculum (we are writing it as we go) for Reading/Writing. It is titled "Revolutionaries of the Past." We've been studying revolutionists such as MLK Jr., Rosa Parks, Susan B. Anthony, and a few others. It fit in perfectly with Black History Month too! I actually had a great time with this unit and I feel confident that my kids are passionate about what they are learning. Now it is coming to the hard part, teaching the kids how to write speeches. They are going to be writing a speech, after doing individual research, from a perspective of a revolutionist of their choice. The chart above was created during one of my lessons and was made after watching multiple speeches on YouTube and students brain storming together. They are going to start their research and speech writing next week. #2. My adorable Super Hero Writing Checklist Posters that I am in love with. Not only do they brighten up my room, but they are SO helpful to the students. I placed them surrounding my quick write wall. We usually do a quick write in class everyday or so for ten minutes. 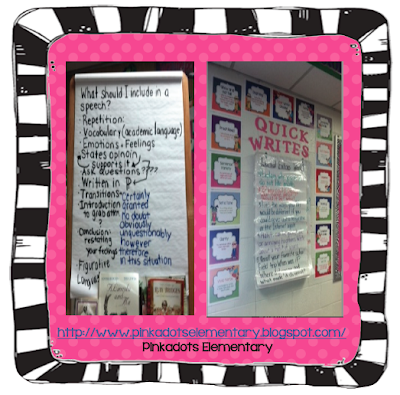 It helps tremendously with writing fluency and stamina! #4. Monkey Bread! YUM! Absolute heaven, although you probably just gained five pounds by looking at the picture! My husband has been dying for it and I thought I'd get wife of the year by making it...even if I did break my diet! I searched Pinterest and found a bunch of great recipes, I combine a few and... tadaaaa! The kids LOVED it and I took the rest to work the next day for my co-workers. #5. New perfume! I put it on my wish list for my birthday next month! I (also) found this sample in a magazine! (See...snow day today and I even got to look through a magazine!) It's Coach Love and boy do I LOVE it! Thanks for stopping by! Happy weekend!! 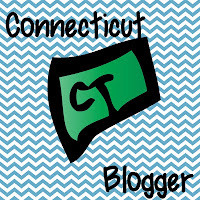 Proud to be a Connecticut Blogger! Check out the other CT bloggers! 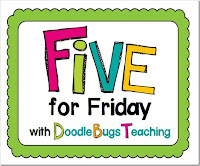 Our friends over at Fifth in the Middle have created a great way to find teaching blogs based on regions and states. Link up to see what fellow bloggers are geographically close to you! I'm super excited to share my adorable of leprechaun desk cards for my first ever Manic Monday Linky! 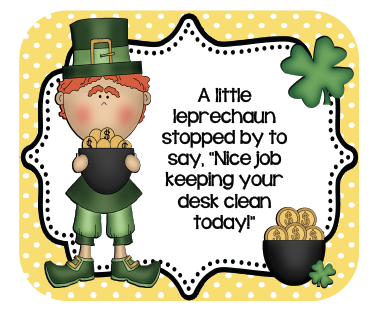 I use these cute cards for positive reinforcement in my classroom for the students who keep a neat desk! Sometimes I use "Desk Fairy" cards, but for March, I figured I'd change it up! My fourth graders love receiving these in their desks and if they are really lucky they might receive the card and a special treat (new pencil, pencil top eraser, or candy). 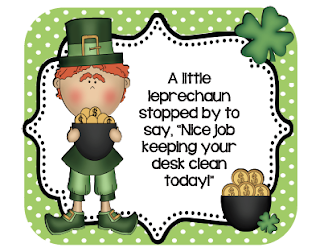 It sure makes the desks in my classroom neat and tidy, especially because the leprechaun comes at random times throughout the day! 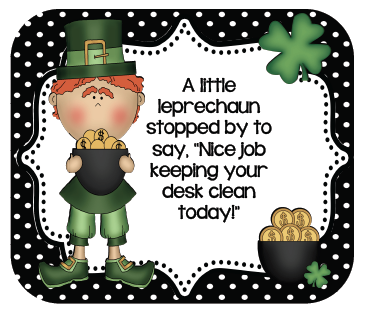 You can download the FREE desk cards at my TPT store here! Check out the Manic Monday blog for some awesome freebies every Monday!